HIV/AIDS is a global challenge that knows no boundaries. Unless it is stopped, this devastating pandemic will continue to affect the lives of millions of men, women and children throughout the world. With the free distribution of HIV, Health and Your Community: A Guide for Action, the Los Altos Rotary AIDS Project hopes to accomplish two important goals  provide health care workers and clinics with practical HIV/AIDS information and encourage community leaders to become involve in the fight against this lethal disease. 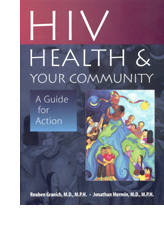 This book is a comprehensive, easy-to-understand guide for health workers and others concerned about HIV/AIDS around the world. It is equally welcome in a rural village in southern Africa, a major city in Thailand, or a Peace Corps volunteers backpack. Designed as a manual for people confronting the HIV epidemic in their communities, it is easily accessible to those without medical or technical knowledge and without prior training in the prevention of HIV or the care of people with AIDS. Topics range from the biology of the virus to designing prevention programs, from the epidemiology of the disease to writing grant proposals. The authors discuss the risk factors for infection and suggest helpful methods for explaining them and assisting people change risky behaviors. Instead of extensive discussions of medical treatments not available to the vast majority of people with HIV, the book focuses on public health interventions that are possible in less developed settings. An appendix aimed at readers with more health training discusses common HIV-related illnesses and their treatments. The authors use contemporary examples from their experiences on three continents to emphasis the most common problems associated with HIV/AIDS, related illnesses and available treatments. Illustrations are used throughout the book to highlight important topics and to make the text more understandable. Bunmi Makinwa of UNAIDS (Joint United Nations Programme on HIV/AIDS) calls it Clear, concise and accessible. UNAIDS has ordered a special printing for distribution through its network. With the assistance of a $40,000 grant from The David and Lucile Packard Foundation, the Los Altos Rotary AIDS Project has purchased a special printing of 5,000 copies of this book. These books are being distributed, free of charge, to Rotary associated clinics in developing countries and Rotary Clubs in these same countries with the goal of encouraging them to become active in the fight against HIV/AIDS. If you know of clubs or clinics that would benefit from this information, please contact us at info@rotaryaidsproject.org. © 2009. Los Altos Rotary Club. All rights reserved.